The US Government and the Fed measure inflation in a way that is tantamount to reverse Robin Hood theft. Government measures cheat savers and particularly senior citizens while subsidizing the wealthiest big banks and leveraged speculators. They do so by giving the Fed an excuse to perpetuate the ZIRP. The headlines screeched this morning that consumer prices fell in September. The media dutifully reported that the seasonally adjusted headline number fell 0.2% month to month. The seasonally adjusted core CPI ex food and energy reportedly rose 0.2%. Nobody in the media questions whether the data accurately represent inflation. But these numbers do not measure “inflation” accurately. They exclude asset prices and do not properly measure consumer prices. They suppress the reported numbers primarily by vastly understating the rapidly inflating cost of housing, to which the BLS gives the heaviest component weight in CPI. Seasonal adjustment also suppressed the numbers this month. The basis for using seasonal adjustments on CPI is weak. While prices do not rise on a straight line, there’s little evidence of consistent seasonal variation. On a not seasonally adjusted basis total CPI dipped by -0.15% in September. Core CPI rose by 0.3%. On an annual basis, headline CPI was down 1.9%, mostly on falling energy prices, which have stabilized this year (gasoline prices up 13% since January). Core CPI was reported to have risen 1.9%. That’s still below the Fed’s 2% target. Here’s the biggest problem with these numbers. Housing costs account for 37% of headline CPI and 41% of core CPI. The government uses an artificial measure of housing costs called Owner’s Equivalent Rent (OER). It was imputed at a seasonally adjusted rate of 0.3% for September. The annual increase was 3%. The BLS invented Owner’s Equivalent Rent as a replacement for actual housing prices in 1982 because housing inflation caused the CPI to increase too fast. The government created CPI as a means to index government benefits, salaries, and procurement contracts. The government gets off cheap when it undercounts housing inflation. The imputation of a false, understated measure for housing costs has saved the government countless billions in the past 33 years and it continues to do so today. For example, in little noticed news today the government announced that Social Security recipients will get no increase in their benefits. What a scam. You can bet a few Congressmen will be hearing from constituents about that. Actual house price inflation is running at approximately 6% annually. Actual rent increases are running at a rate close to that. According to national housing research firm Axiometrics, annual effective rent inflation was running at +5.3% in September. It was the 8th straight month of increases of 5% or more. For the government to be imputing rent inflation in CPI at 3% instead of the actual 5.3% is nothing less than fraud. If housing inflation was included at the correct rate it would add 0.9% to annual core CPI. The correct rate of Core CPI would be +2.8%. A useful measure for testing this is the BLS’s Producer Price Index for Finished Consumer Goods less Food and Energy. This represents wholesale prices of consumer goods to retailers, which are invariably passed through to the retail consumer. That number was essentially unchanged on a month to month basis in September, slipping by 0.05% (5 hundredths of one percent). It is up by 2.6% year over year. So while the US Government finds ways to continually punish senior citizens, either by confiscating their savings with ZIRP, or denying them cost of living increases in the Social Security checks by using fraudulent data, in actuality, inflation marches on at somewhere around 2.6%-2.8% per year. Meanwhile the Fed remains behind the curve in recognizing that if measured honestly, consumer goods inflation has been above the 2% target rate it announced in 2012 all along. 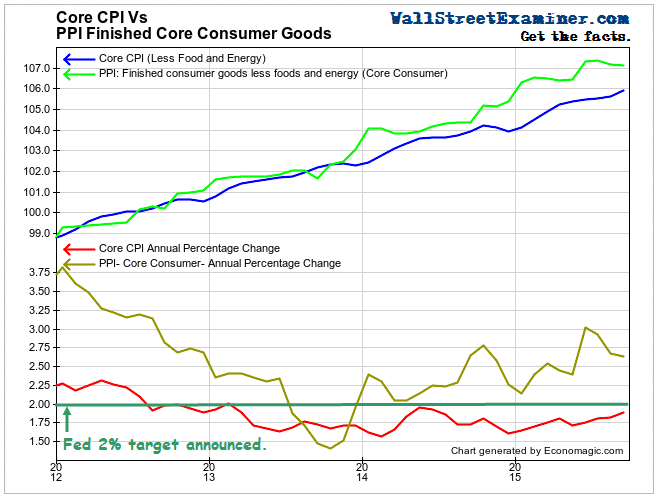 Sadly, the Fed favors a measure called PCE which is even more suppressed than CPI. As long as the government plays with the components of these measures to understate actual consumer price inflation the Fed will have a convenient excuse to never raise interest rates. The distortions and dislocations caused by ZIRP will continue to fester.